T-Systems and Eaton network industrial applications to carry out predictive maintenance of complete systems. Cooperation for Industrial Applications: Christof Spiegel, Managing Director at Eaton (left) and Wilfried Bauer, Head of System Integration, Internet of Things at T-Systems. 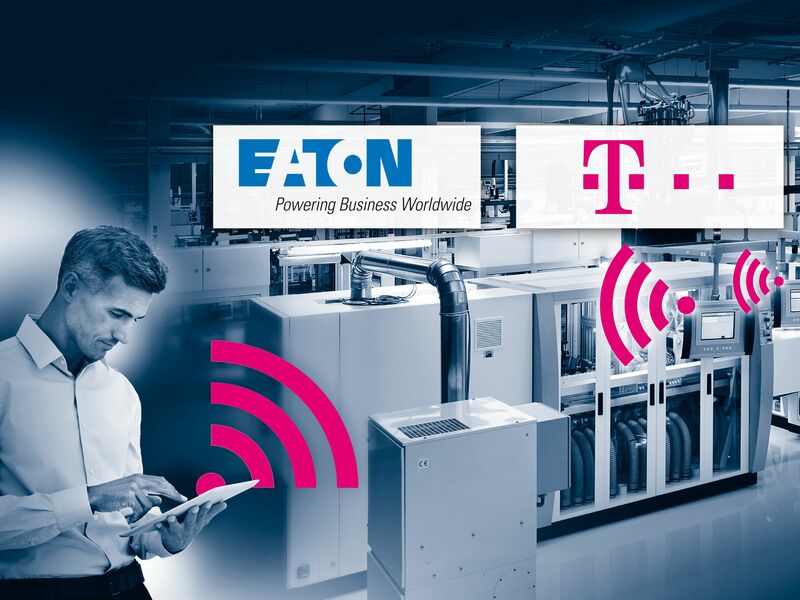 T-Systems and Eaton have collaborated to develop secure Internet of Things (IoT) solutions that allow machine and system builders to network their applications in the Cloud. Electrical and industrial control components from Eaton provide easy connection, based on the OPC UA standard, to the multi-IoT platform of Deutsche Telekom's subsidiary. This will enable machine builders to monitor and carry out predictive maintenance of complete systems directly from the Cloud, as well as optimising control of wear and tear, operating costs and productivity of the machinery by using intelligent data analysis. The new IoT solutions provide manufacturers with a major advantage. Thanks to the analysis capabilities of extensive machine data throughout the entire life cycle of one or more machines, irrespective of their location, vast and diverse possibilities for productivity and efficiency gains have been opened up. Together with pilot customers, the companies are developing IoT service packages that address different use cases based on live data from ongoing production. These will enable machine builders to better manage their operations. Users would, for example, be able to determine when worn parts need replacing. They could also analyse the relationship between production output or individual consumption data and components used, such as filters and raw materials, and/or process data, such as temperatures and pressures, in ongoing production processes. “Small and medium-sized machine and system builders don't usually have the opportunity and the means to invest in secure, high-performance IoT and Cloud technology. It is a great opportunity for them to join forces with trusted partners who can offer them a simple, holistic and safe way to get their machines IoT ready and help them take advantage of the possibilities related to cloud services,” said Stefan Selke, MOEM Segment Marketing Manager EMEA at Eaton. Today, only five per cent of the potential of IoT is being used (source: Pierre Audoin Consultants). Reasons for this include the complexity and security of the IoT. T-Systems’ multi-IoT platform makes it easy and safe for mechanical engineers to enter the IoT because it combines and connects all the IoT components that the customer wants – whether platforms, IoT devices or software solutions. The multi-IoT platform is hosted and operated in T-Systems’ German high-security Cloud computer centre, and meets the strict standards of the German data protection act. At SPS IPC Drives in Nuremberg, Europe's leading trade fair for electrical automation, the two companies will for the first time present their offering to the market. From 22 to 24 November 2016 visitors to the Eaton booth (9-371) can learn more about the customer benefits and see live demonstrations of how machines and systems can efficiently and affordably be made “IoT ready” with Eaton technology and linked directly to Cloud infrastructure with T-Systems.